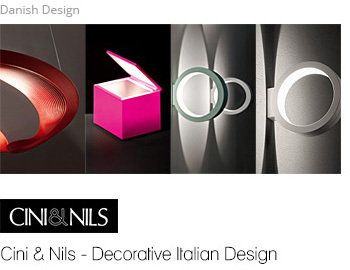 Cini&Nils was established in 1969, when two designers began to feel the need to offer their projects directly to the market. A variety of products were developed by the combined efforts of Mario Melocchi and Franco Bettonica, many of which have since been acquired by the New York Museum of Modern Art. Towards the end of the seventies, design underwent transformations that led Franco Bettonica and Mario Melocchi to explore new areas. In 1972, an idea by Franco Bettonica led to the creation of the Cuboluce, a link in the chain between décor accessories and lighting, the forebear of a new generation of products that first saw the light of day in 1982 with the Aureola Collection, the first fittings to take the Cini&Nils name into the lighting market.